Off-the-grid early adopters weren’t as fortunate as today’s homeowners. Solar panels are so common and widely used that they are no longer considered a risky investment. In fact, take a closer look at your community. 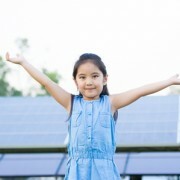 Chances are more neighbors are using solar than you realize! The best thing to do is conduct some quality research before making your decision. You can find arguments for and against solar on the web, but the best thing to do is have a personal consultation that is customized for your home and real estate market. We are experts in everything solar, and we offer free, personalized home energy analyses that can give you detailed information about the cost effectiveness of solar energy for you. This will allow you to make a more informed decision. Give us a call today at 888-926-0809. We’ll give you the ultimate yay or nay on your burning question: is solar your home’s soul mate?